There are a limited number of rooms available at the Marriott Marquis at the special show rate of $369 per night plus tax. Please note there will be a deposit of one night room and tax for all reservations. Complimentary in room Wifi is included in this rate. This rate will be available until May 1, 2017 or until the group rate is sold out. To book a room at The Marriott Marquis please call hotel reservations at 888-575-8934 or click the button below. This rate will be available until May 1, 2017 or until the group rate is sold out. 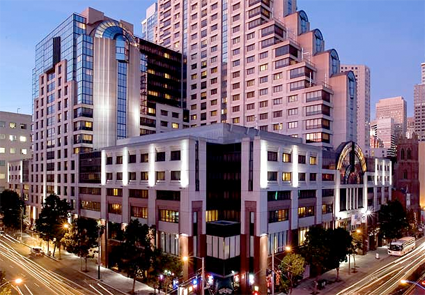 Discover the Downtown San Francisco Marriott Marquis Hotel which exudes an essence of modern luxury and the convenience of an extraordinary hotel in downtown San Francisco, CA. Just south of Market Street, this hotel in the SOMA district is next to the Moscone Convention Center and steps away from the Yerba Buena Gardens, renowned museums and cultural attractions, world-class shopping on Union Square, and AT&T Park, home of the San Francisco Giants. Enjoy inspiring penthouse views and cocktails at The View Lounge or the finest contemporary cuisine at Mission Grille before retiring to luxuriously appointed San Francisco, CA hotel rooms and suites. Renowned as a meeting hotel in San Francisco, this business hotel provides flexible and expansive event venues to accommodate both grand and intimate San Francisco hotel receptions. Whether in town for business or pleasure, experience San Francisco at the Marriott Marquis hotel in San Francisco, CA where you're sure to leave your heart. Program by: Talent Analytics, Corp.